Does Misogyny Exist In Hollywood? 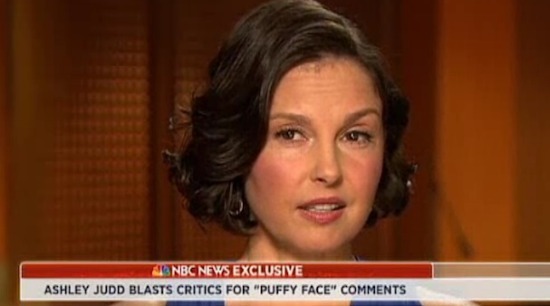 Ashley Judd Says "Absolutely!" Actress and philanthropist Ashley Judd recently gave an interview with Hiflix about her new movie ‘Dolphin Tale 2′ which she stars in alongside Harry Connick Jr. While the the conversation about the movie was the usual promotional material, the rest of the interview was fairly unusual because it spoke about a major problem in Hollywood: misogyny. First of all, the fact that Ashley Judd is using what should be a standard promo interview for her new film as an excuse to speak against the boys club in the very industry that employs her is pretty brave. And we love brave women who aren’t afraid of offending others, especially when what they are saying is an important message. When asked whether Hollywood is still steeped in sexism, she had a one word answer: “Absolutely”. She says being on set, she has experienced sexism first hand and that it still goes on today. But as she has progressed in her career, she isn’t afraid of speaking out about it anymore. She gives an example of one set she worked on where a ladder was continually placed in front of the women’s restrooms, not the men’s as if it was symbolic of a crew member thinking it more important for men to have access to a bathroom. Ashley doesn’t hold back in confessing she was the victim of “egregious sexual harassment” from a studio executive, and has experienced producers saying very sexually charged things to her face. Wow! How about that patriarchy huh! Ashley says after discussing her harassment experience with other female actresses, it pointed out something crucial to her, which we can all take away from. Speaking of the patriarchy, Ashley wrote a scathing article in the Daily Beast in 2012 around the time she was recovering from an illness and had to be on certain types of medication. One of them specifically was steroids which, if you are familiar with the side effects of the drug, force your body to balloon a little and put on weight. You may remember how many media outlets attacked Ashley, accusing her of plastic surgery and too much botox. She decided to set the record straight herself, and do more than that. She slammed the systemic brainwashing of how our culture forces us to ridicule anything that doesn’t fit into the “norms” of what we are used to. “The Conversation about women’s bodies exists largely outside of us, while it is also directed at (and marketed to) us, and used to define and control us. The Conversation about women happens everywhere, publicly and privately. We are described and detailed, our faces and bodies analyzed and picked apart, our worth ascertained and ascribed based on the reduction of personhood to simple physical objectification. Our voices, our personhood, our potential, and our accomplishments are regularly minimized and muted,” she wrote. While she addressed every aspect of what the media was saying about her appearance, the worst part was how many women were part of the crowd attacking her, reinforcing why the patriarchy exists and the power it still wields. The call to action is to change the conversation. We can all do this at our own level, which, if multiplied by the number of people on earth, will make a great impact and shift the tried attitudes still being peddled by the media. If change is needed, we have to be the agents for it and believe the part we play is going to make a difference.